A large portion of the infrastructure in most countries consists of reinforced concrete structures such as buildings, factories, bridges, dams, roadways, and canals. As these concrete structures age, non-destructive evaluation (NDE) becomes increasingly important. The assessment of these structures is the basis for any safety classification. Of equal importance is the need for quantitative description of the state of all structures for rehabilitation, maintenance and budget planning. Almost exclusively, this assessment is done through visual inspection. Depending largely on the experience of the inspectors and the correct analysis of the inspection (FHWA, S.25), visual inspection fails to adequately evaluate the correct grouting of ducts or the corrosion state of the tendons. As a result, non-destructive techniques would be more valuable. NDT methods for the evaluation of tendon ducts would be a very useful tool for owners of post-tensioned structures. Besides radiography, there is no NDT method available which can be used, e.g. by bridge inspectors for on-site measurements. IE has been described as a useful tool for such inspection tasks, but there have been conflicting reports about the reliability of these measurements (Carino and Sansalone 1991) (Bujard et al. 2001) (Krieger 1999) (Ghorbanpoor 1993). Impact-Echo (IE) is an acoustical testing method for concrete which is used for a wide range of testing procedures and is described as a promising tool for the NDE of concrete structures (Carino 1984) (Sansalone and Street 1997) (Ghorbanpoor 1993). Different designs of IE-Systems that can be used for measurements on site are commercially available. However, this equipment is designed for point measurements. The IE technique is almost exclusively used as a point method. No systematic scanning measurements are reported, and data analysis is not available for investigations that are performed by scanning along a line or over an entire area. Fig 1: Automated impact-echo system. The laboratory and field measurements presented in this paper were carried out by scanning IE measurements on specimens with tendon ducts to ensure the reliability and the interpretation of data. A commercially available IE-System was included in an automatic data acquisition system. Specialized software was developed both for automated data acquisition along lines or over areas and for data analysis. Such testing was suggested earlier (Ghorbanpoor 1993) as the result of study on posttensioned bridge structures using IE. Impact-echo is an acoustical technique where a mechanical impact generates a sound wave in the object under investigation. A sensor measures the vibration of the surface close to the place of the impact. The recorded waveform is then analyzed using fast Fourier Transform (FFT.) to identify dominant frequencies in the waveform. If the velocity of sound is known, any peak in the frequency spectrum can be assigned to a reflector in the depth using the simple IE equation: d = vs/2f. This analysis is used assuming that a standing wave between the surface and the reflecting object is generated by the impact. Therefore, multiple reflections must take place requiring that the attenuation of the sound is not too high. 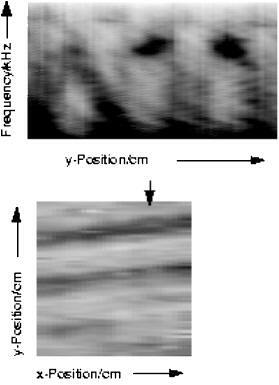 When multiple points are investigated along a line, the result can be visualised in a manner similar to a radar image or an ultrasound B-scan. The results are plotted as colour bars next to each other, generating an image position vs. frequency (depth) where the corresponding intensity is represented by a grey value. Using such images, it becomes obvious if a signal belongs to an indication of a true reflector or to noise or other sources. Scanning multiple lines parallel to each other, an area can be covered with point measurements and then visualized taking arbitrary slices through the 3D data cube. Following the convention used for ultrasound experiments (Reference BCD Scans), a single point measurement is represented by an A-scan, a line scan through a B-scan. C-scans are slices parallel to the surface. D-scans are generated combining values perpendicular to the direction of the line measurements and to C-scans. In order to avoid any influence by non-reproducible sources such as the exact positioning and pressure by an operator, the IE-sensor head was mounted on a frame with two axes. 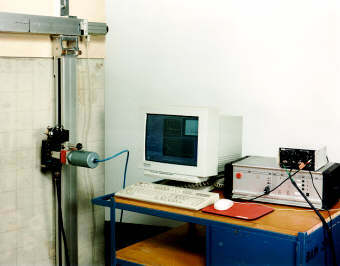 Both axes can be moved using stepping motors to ensure the reproducibility of the measurement at a specific location. The sensor is pressed to the surface using a pneumatic cylinder through which the pressure can be adjusted very exactly. Typically, the pressure used was 160 N.
The whole system is fully automated and able to measure approximately 100 points in 10 minutes. The system set-up is a laboratory design but was also used for on-site measurements. It can be mounted on a vertical or horizontal surface. The electric signal from the sensor is amplified and digitized (12 bit, sampling rate 150 KS/s). The length of the recorded waveform is 2048 points (13.5 ms). The frequency range of the systems goes as far as 70 kHz, but signals from measurements on concrete are mainly in the frequency range below 20 kHz. Higher frequencies are highly attenuated in concrete. The system has two resonance frequencies that could only be identified through the automated measurements, one at 20 kHz and a second, smaller one at 14 kHz. It was not possible to remove either resonance. One resonance might be due to the frame mounting. The principle of the IE technique requires the data analysis in the frequency domain. It might be necessary to remove a DC offset in the waveform that can be easily realized using a high pass filter. The recorded waveforms are much longer than the actual IE-signal. Therefore, a time band pass filter can be applied cutting out the portion of the waveform that contains the signal. 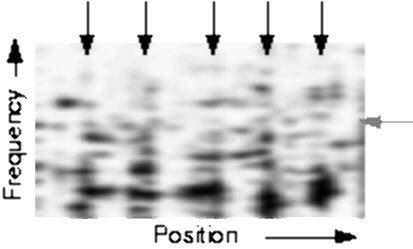 When it is known at which frequency the signal is expected, a spectrogram plot can be utilised for visual verification. The power spectrum of the waveform then reveals the frequencies at which resonance takes place. The corresponding depth value can easily be found, e.g. using the IE-formula, provided that the velocity of sound is known and constant. Typically, the velocity of sound is retrieved from measurement at a location with known dimensions, is taken from a core or is simply guessed. Sometimes relative values for the thickness are enough to satisfy the client. Fig 3: Thickness plot of specimen "stepped plate with duct". The positions of the duct and the step are indicated by arrows. For the data analysis of raw IE waveforms, a number of filtering and visualization techniques are appliedin the BAM IE-data analyses and can be used, if necessary, to improve the results. These techniques include: DC offset removal (through high pass filtering); spectrogram-plot (to visually determine the optimum time band pass limits); time band pass (with or without zero padding); deconvolution of the impact waveform (by using the first half cycle (P-wave) as the impact waveform); frequency domain filters (high pass, low pass, band pass, boxcar, Butterworth low-, high- band pass, Lee filter, Butterworth band suppress filter); normalization (integral over the whole spectrum, integral in a region of the spectrum, maximum in region of spectrum). 3D-Data: B-Scan (single or average over several B-Scans); D-Scan (single or average over several D-Scans); C-Scans (single or average over a range of C-Scans); Depth-Scan (2D-Depth profile). 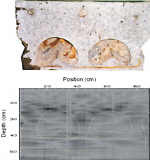 Fig 4: C-scan from specimen containing a duct with grouting defects. The duct is measured at a frequency of 3.52 kHz (57 cm), slightly smaller than the backside echo. No direct signal from the duct was measured. No indications of the grouting defects could be found in the impact-echo signals. These data manipulation tools are integrated in a system of programs behind a graphical user interface. The reproducibility of the data that was collected with the automated data acquisition was verified with an area scan on a specimen. This scan was repeated after several weeks. In the repeated scan, the frame had been moved, but the exact position of the measurement points could be reproduced with an error of less than 5mm. The result was very convincing; the average curves where practically identical, even very small amplitude peaks in the frequency plot could be reproduced. Experiments employing SIE were performed on a large number of specimens, both in the laboratory and on structures on site. The laboratory experiments were very useful to perform in depth studies with an excessive number of point measurements in order to clearly identify the applicability of SIE to a given problem. Of special interest has been the investigation of tendon ducts, their localization, concrete cover and grouting. The following section describes the specimens, the testing aim and the results of the testing. Table 1: Summary of test specimens and testing results. This specimen is 1000 x 1000 mm2 and 210 mm thick. One part with a width of 350 mm has a reduced thickness of only 160 mm. In addition, a metal tube (40 mm diameter) is inserted in the middle of the thicker part of the plate parallel to the step. Line scans were performed perpendicular to the tube and the step. The thickness of the plate could be measured, the tube was found by a shift of the backside echo towards greater thickness. The position of the step could be measured with an accuracy of approximately 10 mm after normalizing the data to the maximum in the frequency range 7-12 kHz. The frequency limit of the set-up was 22 kHz, a direct reflection from the metal tube was not recorded. There are four similar specimens available. They differ in the duct type (metal/plastic) and the maximum aggregate size of the concrete (16/32 mm). In one specimen, the duct was grouted, leaving some intentional voids, but no strands were inserted. This specimen has been tested in depth using several NDT methods (Krause et. al. 1995) and described in detail there. Area scans of different point densities were performed on those specimens. The concrete cover over the duct should allow directly measurement of the duct cover, but a direct reflection from the ducts could not be assigned in any of the cases. After data manipulation, in all four cases the duct could be localised through the apparent increase of the thickness of the walls at this position. The frequency shift in all cases was 0.3 kHz. The best contrast was found for the walls with plastic ducts. In the case of the grouted metal duct, the contrast was poorest. In the frequency range of the direct detection of the duct (~20 kHz), no signal was found which could be attributed to the presence of the duct. 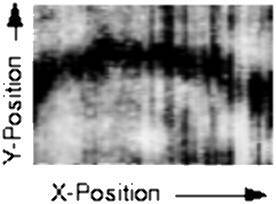 Only the average of the frequency range 15 - 20 kHz showed after multi-step data analysis and manipulation the shape of the duct in the C-scan, as a reduction of the frequency amplitudes. This effect is so small that it would certainly have been neglected in point measurements. Although the grouted duct had the smallest S/N ratio for the localization of the duct, it was not possible to assign the grouting voids to an impact-echo signal. Variations in the signal intensity were obviously due more to geometry effects than to possible grouting differences. A specimen designed for investigating the resolution of NDT methods in detecting ducts was tested using SIE in line mode. There are 5 ducts (50 mm diameter) in the specimen (size 1000 x 200 x 150 mm3) at different depths. One duct is directly positioned below a rebar. In Figure 5, the result of the line scan along the long side of the specimen is shown after data analysis. The lateral duct position can be identified through the frequency shift of the backside echo and the amplification of this shifted echo. The ducts are close together so that in the case of a test situation without pre-knowledge, the interpretation of the data would have been very difficult. Fig 5: Line scan along the long axis of the specimen with 5 ducts. The positions of the ducts are indicated by the top arrows. The backside signal would have been expected at the frequency of the right arrow. The backside reflection cannot be assigned to any signal without pre-knowledge. Over the ducts, the signal of the back face shifts in frequency and increases in intensity. Bridge beam with post tensioned duct and large void. A large bridge beam was moved to the laboratory when the bridge was taken out of service. In order to reduce the weight of the beam, a formwork was positioned in the beam at the time of fabrication. On the lower side of the beam, three ducts with post-tensioning ran symmetrically along the length of the beam. These ducts had grouting defects (only half- filled with cement), and the formwork shifted upwards during casting at one end. Area and line scans were performed on the specimen to locate the formwork and the ducts. Additionally, the identification of any grouting defects was of interest. Two line scans along and across the beam are shown in Figure 6. The top of the formwork could easily be identified in the B-scans, and the shift of the formwork was identified. Fig 6: Bridge beam specimen with two cavities and three tendon ducts (top). SIE B-Scan (bottom) shows direct signals from the top of the cavities but no signal which could be assigned to the presence of the ducts. Regarding the location of the ducts there was no signal in the data that could have been related to the tendon ducts. The reason for this might have been the concrete cover of only 100 mm which corresponds to a frequency of 20 kHz, which is at the limit of the system. Because of the complicated geometry of the specimen, no thickness signal could be used to identify the ducts through the frequency shift of the backside echo. A common design of concrete bridge decks is a concrete plate (thickness 250 mm) that is post- tensioned perpendicular to the length of the bridge. These post-tensioning ducts and the tendons inside are vulnerable to corrosion when water penetrates below the asphalt cover and the sealing between asphalt and concrete. When the asphalt is renewed, the concrete is exposed and the tendons are accessible for inspection. During such rehabilitation measures, testing of the duct and tendon condition is possible. Experiments on a dismantled bridge in Germany were very difficult, and the interpretation was ambiguous. Therefore, a bridge deck specimen was built to study the testing problems in depth. Fig 7: Bridge deck specimen. Top: Scan across three tendon ducts. The lateral position of the duct is clearly identified through the shift of the back face echo signal. (The signal processing enhances the overall amplitudes at the flanges of the ducts.) bottom: Scan along a duct which was partially grouted. The variations in signal intensity cannot be attributed to grouting defects, they are due to geometry effects of the specimen. The bridge deck specimen is 2000 x 1500 x 250 mm3 and includes 3 metal ducts (diameter 40 mm) with slightly different concrete covers. One duct was grouted after performing reference measurements. Extensive area scans were performed to locate the ducts and to identify the difference between grouted and empty sections in the ducts. 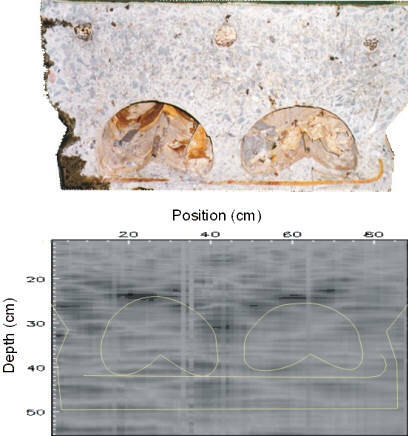 Fig 8: SIE B-scan (top) across 3 ducts in Haiger bridge girder and C-scan (bottom) in the plane where the ducts were measured. The measurement position of the B-scan is indicated by an arrow in the C-scan, the measurement direction was upwards. 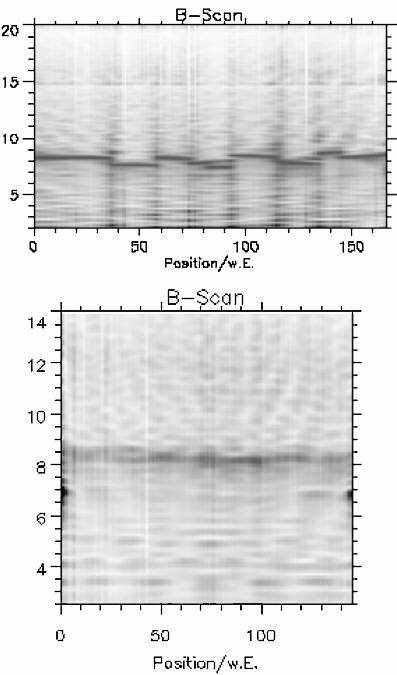 The leftmost duct in the B-scan shows a different signal amplitude and "side bands" around the position of the duct. The other two ducts just show the direct signal. Duct "A" was later identified as partially grouted (through cores). Again, the lateral position of the ducts could be detected through a frequency shift of the back face echo. No direct signal from the duct could be assigned. The lateral position of the ducts was best visualized by normalizing the B-scan amplitudes to the maximum value in the frequency range of the back face echo. Through the normalization procedure, the right and left flanges of the ducts are enhanced, giving a clear indication of the duct size. The measurements along the ducts and parallel to them showed intensity variations (of the corresponding backside echoes) unrelated to the grouting condition of the ducts. In the C-scan images, it becomes clear that those intensity variations, are due to the geometry of the specimen. The small impact of the IE excitation generates surface vibrations of the specimen. These patterns are not only pronounced in the low frequency regions but also easy to identify in the frequency range of the back face echo. The "geometry effects" of the surface overlay the true IE- signal: from the interior of the specimen at the edges and on the specimen with limited dimensions. Comparing grouted and ungrouted ducts proved to be very difficult and inconclusive. Although the grouted ducts seemed to generate a less intense backside echo, this effect was indistinguishable in point measurements. A large highway bridge in Germany was rebuilt because of structural deficiencies. Non-destructive testing methods were used on one bridge girder for extensive testing to assess the condition of the girder (Krause, Wiggenhauser & Krieger 2001). An end section of the girder where the ducts run diagonally upwards was chosen for duct inspection. Automated SIE was used to scan an area 910 x 1000 cm² with a step width of 10mm vertical and 50mm horizontal. The thickness of the girder was 280 mm. The concrete cover over the duct was between 95 and 98 mm (determined later on cores), the diameter 80 mm. This specimen showed no geometry effects unlike the laboratory specimens. The frequency shift of the backside echo at the position of the ducts was small and might easily be missed in point measurements. The thickness of the girder could be measured very easily, it varied systematically between 281mm (right bottom) and 324mm (left top) with vs=4000m/s. Two accurate measurements through boreholes did not verify this variation (275 and 284 mm thickness outside the measurement area), suggesting that variations in the velocity of sound causes this effect. The change is quite significant (3%) and limits the accuracy of the thickness measurements. A weak double signal (2% of the backside echo amplitude) was measured at 24.3 kHz (82 mm) and 25.5 kHz (78 mm) in the frequency range where a direct signal from the ducts was expected. However, the C-scan reveals that the correlation between the ducts and the signal is too weak to assign this signal to a direct measurement of the duct cover. In point mode, this signal is indistinguishable from noise. Only the average of many point measurements makes this signal significant. The ducts in the scanned area could be easily located by an IE signal which appeared in the frequency range 12-13.5 kHz (corresponding to a depth of 166 - 148 mm using the IE-formula). Obviously, the IE-formula is not valid for such a testing case. But the factor 2, which is added by Street and Sansalone (Sansalone & Street 1997), also does not exactly reproduce the correct cover. This was the first and only case in all duct investigations described in this contribution where an IE signal could be unambiguously attributed to the presence of a duct. The lowest of the three ducts crossing the measurement area showed the largest frequency shift for the backside echo. In addition, the B-scans perpendicular to the ducts displayed "side bands" of higher IE-signals shifting to lower frequencies with a larger distance from the duct. The right end of the middle duct showed the same effect but to a lesser degree. Ungrouted ducts are a serious durability and safety hazard to all post-tensioned concrete structures. The natural corrosion protection of the strands by the high alkalinity of the grouting cement protects the steel from corrosion. Impact-echo has been described as an on-site NDT method for duct inspection. Automated SIE has been employed to minimize human operator influence such as variations in sensor positioning or excitation. Also, the system allows excessive number of IE point measurements through automatic data collection. The system worked reliably in the laboratory and on-site and generated excellent, reproducible data. All specimens investigated in this study incorporated at least one duct. Regular patterns in the B-scans, especially of specimens with plate-like dimensions, are interpreted as geometry effects. It was found that these patterns depend only on the surface dimensions of the specimen and contain no information about the inner structure of the object. These regular patterns interfere with IE-signals from the backside reflection. They may result in an intensity variation of the backside signal and falsely indicate some internal structure. Geometry effects can only be identified through visual inspection of the line scans. In point measurements, signals from geometry effects cannot be distinguished from signals originating from a true IE-signal. Duct location was possible - for all specimens with plate-like structure - where a backside reflection is identified and a frequency shift of this signal could be used as an indication for the presence of a duct. The bridge beam specimen produced no such reference signal. As a result, the ducts could not be located. Duct location was also possible in the frequency range which corresponds to the depth range of the duct, but the IE-signals were reduced in intensity. Using this effect, the diameter of the ducts was measured more precisely. However, this effect is very small and would have been neglected in point measurements. Only through the large number of measurements taken with automatic SIE could this effect be verified unambiguously. A signal could be attributed to reflection directly from the duct just once (at the Haiger bridge specimen). But the concrete cover could not be measured correctly in this case. Using the modified formula of Sansalone/Street (d=vs/4f), the concrete cover would have been too large. The duct cover could not be measured in any of the other tests, neither in the laboratory nor on-site. There were four specimens investigated with grouting defects, two with artificial voids and two with unintentional voids from structures which were taken down. There were no indications found for the presence of the artificial voids in the laboratory specimens. Either the geometry effects were too large and covered the IE-signals from the grouting defects or there were none. The ducts in the bridge beam specimen could not be located at all. Therefore, the grouting condition (the cores which were taken later showed half-filled ducts) could not be addressed in these tests. The Haiger Bridge Girder was the only specimen where IE-signals corresponded with duct sections with partially incomplete grouting. These sections were identified by the large shift of the backside echo (Sansalone & Street 1997) and "side bands" around the shifted direct duct signal. Duct localization using impact-echo has been found to be a useful tool in situations where the ducts are inside a slab. The thickness of the slab should be small enough to be measurable using IE. A thickness of more than 500mm should be avoided in order to identify the backside echo unambiguously. Geometry effects interfere with true IE-signals in plate-like objects of limited size. On these objects, it must be verified through scanning measurements that geometry effects do not interfere with the interpretation of a signal. Using the backside echo as a reference, tendon ducts can be located by the frequency shift indicating an apparent greater thickness of the slab containing the duct. This frequency shift must be measured against a reference point with known dimesnions. The concrete cover of the duct cannot be measured with precision; a direct signal from the duct was not found in every test case. Even when such a signal is identified, the basic IE-formula will provide a cover that is too large. The modified IE-formula (Sansalone and Street 1997) described in the test case here resulted in a cover that is too small. There have been indications that imperfect duct grouting is detected by a large shift of the backside echo and through "side bands" in B-scans across such ducts. This observation may only be valid in a well-defined test case. It was not observed in other test scenarios described in this study. When IE should be used as the exclusive test method for the investigation of the grouting condition of ducts, the validity of these tests must be verified for the given test scenario. SIE has proven to be suitable for the verification of IE for a given test situation. The data manipulation applied to a full set of SIE data makes it very easy to evaluate a given measurement task. B- and C-scan type data representations are helpful for engineers to understanding the data..
Impact -echo can reliably be used for quality assurance of concrete tunnel liners. In Germany, mandatory testing was introduced for new tunnels (Bundesanstalt für Straßenwesen 2001). Additional research is needed before impact-echo can be reliably used for testing tendon ducts on a regular basis. The research described in this contribution was carried out by Dr. Camilla Colla, Dipl.-Ing. Regine Lausch and Mr. Gerhard Schneider. Their enthusiasm and dedication is greatly appreciated. The test scenarios described were carried out with research funded by the Bundesanstalt für Straßenwesen, Deutsche Forschungsgemeinschaft and Senatsverwaltung für Stadtentwicklung, Berlin. Carino, N. J. 1984 Laboratory Study of Flaw detection by the Pulse-Echo Method, In-Situ/Nondestructive Testing of Concrete, American Concrete Institute, SP-82, pp 557-579. Ghorbanpoor, A.1993: Evaluation of post-tensioned concrete bridge structures by the impact echo technique Publication No. FHWA-RD-92-096, Federal Highway Administration, U.S.A.
Bujard, V., Bruneau, C., Scheller, E., Bailey, S., Brühwiler, E. 2001: Applicabilite de la methode Impact-Echo, Office Federal des Routes, Rapport Final, Fevrier 2001.